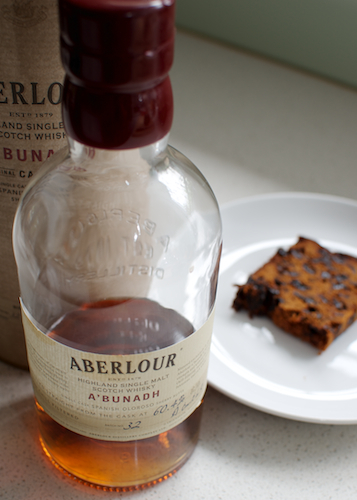 The A'bunadh is a cask strength offering from the Aberlour distillery, located in Speyside. The distillery is part of the Chivas family of whiskys and apparently much loved in France. This expression is readily available from Dan Murphy's in Australia and the batch considered in this review was number #32. The 'sherry bomb' title points to both the bottle and its contents. The former is short and fat, with thick glass and a squat shape. The thick neck has been given the 'dipped in wax' treatment reminiscent of Makers Mark and contains the largest cork stopper I have seen to date. Certainly a substantial and well presented package and despite the bomb-like appearance the bottle pours like a dream, feeling well balanced in the hands. The contents have an incredibly rich burgundy red colour, almost plum. I am unsure how much this has to do with marketing (i.e. caramel colouring) or the sherry cask maturation process. The nose blasts big-round notes of dried fruit, currents, plum and Christmas cake straight up your nostrils...you almost immediately feel like eating this whisky. There is a mellow alcoholic burn, but nothing harsh and its sweetness makes for a very addictive whiff. To taste, well its just the ignition of the sherry explosion...BOOM! dried currents...BOOM! cherry and plums…BOOM! Christmas cake…BOOM! cinnamon and star-anise…BOOM! musty oakiness. You can feel this whisky evaporating before it even hits the tongue, such is the alcoholic content. For my mind, it has a very similar mouth feel to the Sullivans Cove Port Matured Single Cask tried at a previous D.T.W.C. meeting. So I wanted to try a big-sherry cask whisky and that's certainly what this is. I find the flavours echo a Hennessy V.S.O.P. cognac, giving an indication of the strong fortified wine-grape flavours present. The strong alcoholic content from the cask strength certainly entices you to swill it like a cognac. The finish is long and chest warming. Adding water brings out fresher flavours, including citrus fruit and lemon zest. Overall, its a great whisky but its a little too rich for my taste. I feel the whisky needs the 60% abv to add some excitement and to balance the heavy, syrupy sweet flavours. However, I struggle with the mouth feel. Rating, maybe a 5.75 from seven bolts of lightening. Would I buy it again? Maybe, its a great whisky digestive...especially with a piece of Christmas cake on the side. I can say if your looking for the 'Octomore' of Abelour or the 'Sherry Bomb' of Speyside, then look no further. Whilst on the sherry train, I look forward to trying some Dalmore in the future.